A qualified Front-end developer translates the company’s and customer’s requirement into a functional and engaging interactive application. 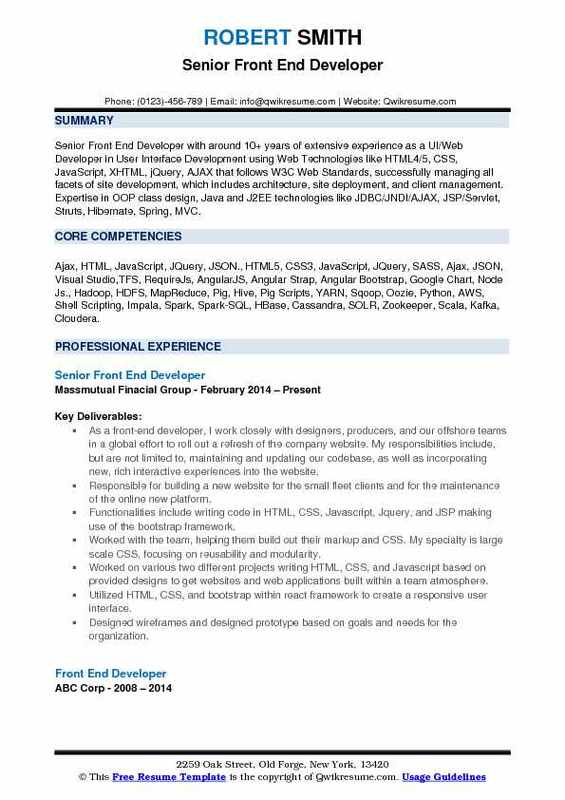 Some Front End Developer Resume showcases job descriptions for the front end developers such as working on new and current microsites, templates or landing pages, giving guidance and troubleshoot problems, fixing front-end bug issues, using markup languages to create an interactive web page, designing mobile-based features, creating quality mockups and prototypes and ensuring superior graphics standards. Leading the front-end development on the completely re-designed core landing. A key member of the team which unveils single-page web applications targeting all, modern platforms for both in-app and browser experiences for 26+ million users. Framework built-in client-side optimization with minified js/css with svg sprites or data-uri. Test-driven development (tdd) with jasmine and karma for unit-testing and code. Automated documentation and tutorial using jsdoc, markdown and raml spec. Managing and conducting the development of multiple ongoing projects. Proven track record of delivering results in an agile environment while 60% remote. As a front-end developer, I work closely with designers, producers, and our offshore teams in a global effort to roll out a refresh of the company website. My responsibilities include, but are not limited to, maintaining and updating our codebase, as well as incorporating new, rich interactive experiences into the website. Responsible for building a new website for the small fleet clients and for the maintenance of the online new platform. Worked with the team, helping them build out their markup and CSS. My specialty is large scale CSS, focusing on reusability and modularity. Utilized HTML, CSS, and bootstrap within react framework to create a responsive user interface. Designed wireframes and designed prototype based on goals and needs for the organization. 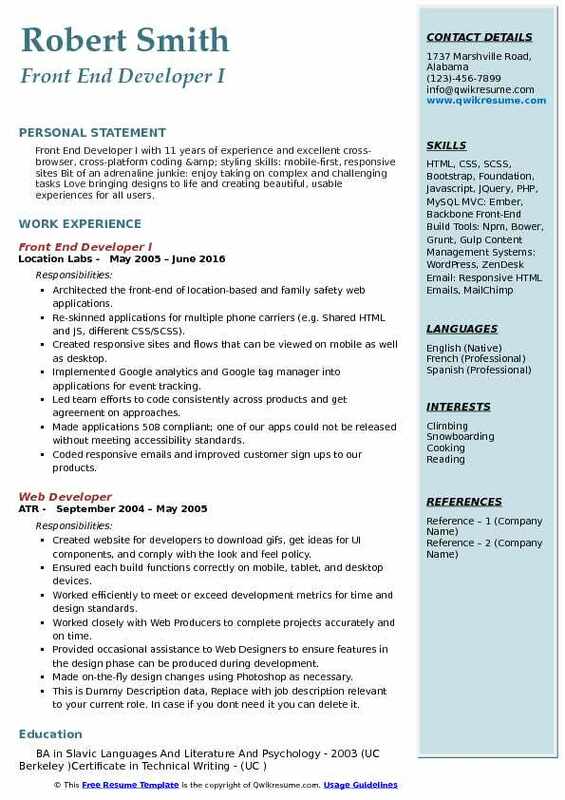 Objective : Junior Front End Developer with around 3 plus years of experience in Telecommunication, Auto Mobile, Banking, and Financial domains. Extensive experiences in HTML5, CSS3, W3.CSS, SASS(SCSS), jQuery, Angularjs, Angular 2, React, Node (NPM), Bootstrap.JS,Php, Core Java. Basic knowledge of Android, Python, and .Net.Involved in Analysis, Design, Development, Testing, and Implementation of Applications, Application Maintenance, and Project Deliverables. Applied jquery core library functions for the logical implementation of all the applications at the client side. Brief experience in implementing the Angular.Js in creating animations based on CSS classes. Used Jquery and Ajax for the service call on pages to interact with the server for information. Used Ajax, JSON to send the request to the server to check the functionality of the website. Created SQL queries to perform insert, update or delete operation on MySQL database. Designing the dynamic and multi-browser compatible pages in the application using HTML5, CSS3, and Angular JS. Integrating the front end using the JSON data from the backend mainly sitecore and .Net API calls. Working closely with the backend team on proxy routing rules. And the understanding of ngnix server. Developing the users' application by editing updating using MVC pattern in AngularJS. Developing the various pages and its architecture in accordance with to UI specs. 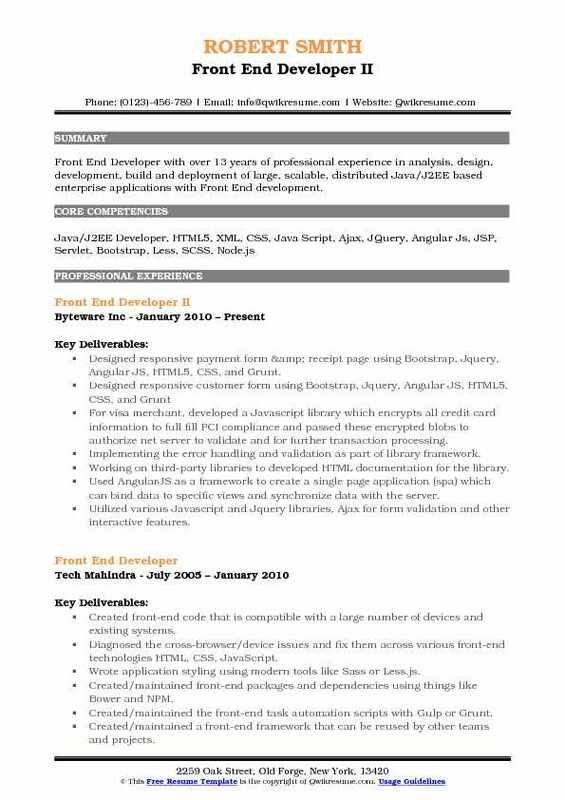 Summary : Front End Developer I with 11 years of experience and excellent cross-browser, cross-platform coding & styling skills: mobile-first, responsive sites Bit of an adrenaline junkie: enjoy taking on complex and challenging tasks Love bringing designs to life and creating beautiful, usable experiences for all users. Architected the front-end of location-based and family safety web applications. Re-skinned applications for multiple phone carriers (e.g. Shared HTML and JS, different CSS/SCSS). Created responsive sites and flows that can be viewed on mobile as well as desktop. Implemented Google analytics and Google tag manager into applications for event tracking. Led team efforts to code consistently across products and get agreement on approaches. Made applications 508 compliant; one of our apps could not be released without meeting accessibility standards. Coded responsive emails and improved customer sign ups to our products. Worked with design and UX teams to improve usability and design of products. Collaborated with project & product managers in setting goals & scoping projects. Maintained front-end wiki that covered everything from onboading new fe devs to SOPs for building applications. 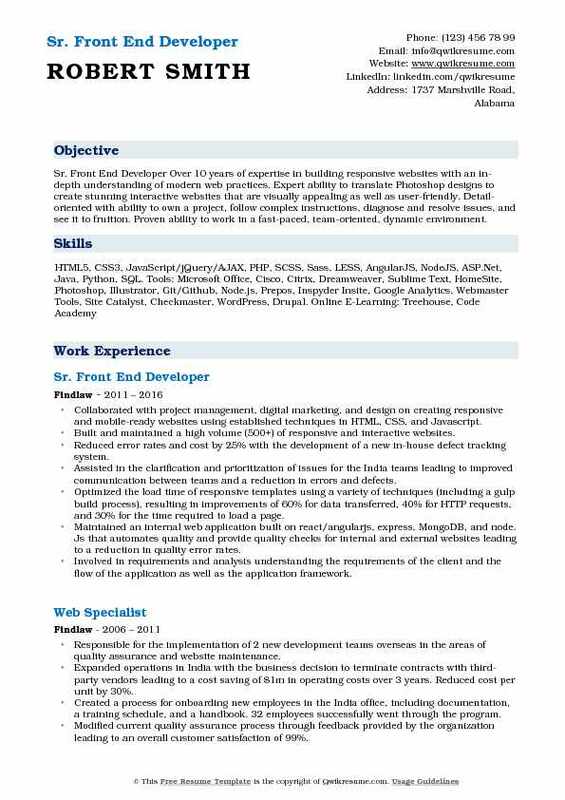 Summary : Sr. Front End Developer Over 10 years of expertise in building responsive websites with an in-depth understanding of modern web practices. Expert ability to translate Photoshop designs to create stunning interactive websites that are visually appealing as well as user-friendly. Detail-oriented with ability to own a project, follow complex instructions, diagnose and resolve issues, and see it to fruition. Proven ability to work in a fast-paced, team-oriented, dynamic environment. Built and maintained a high volume (500+) of responsive and interactive websites. Reduced error rates and cost by 25% with the development of a new in-house defect tracking system. Assisted in the clarification and prioritization of issues for the India teams leading to improved communication between teams and a reduction in errors and defects. Optimized the load time of responsive templates using a variety of techniques (including a gulp build process), resulting in improvements of 60% for data transferred, 40% for HTTP requests, and 30% for the time required to load a page. Maintained an internal web application built on react/angularjs, express, MongoDB, and node. Js that automates quality and provide quality checks for internal and external websites leading to a reduction in quality error rates. Involved in requirements and analysis: understanding the requirements of the client and the flow of the application as well as the application framework. 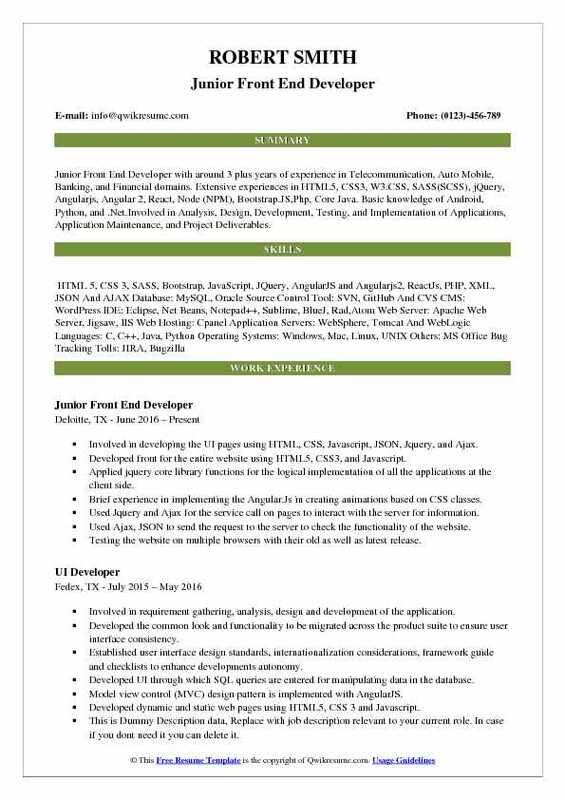 Objective : Front-end developer/designer with 2+ years experience in Analysis, Design, Development, Testing, Maintenance, and Implementation of large scale Business Web-based platform. 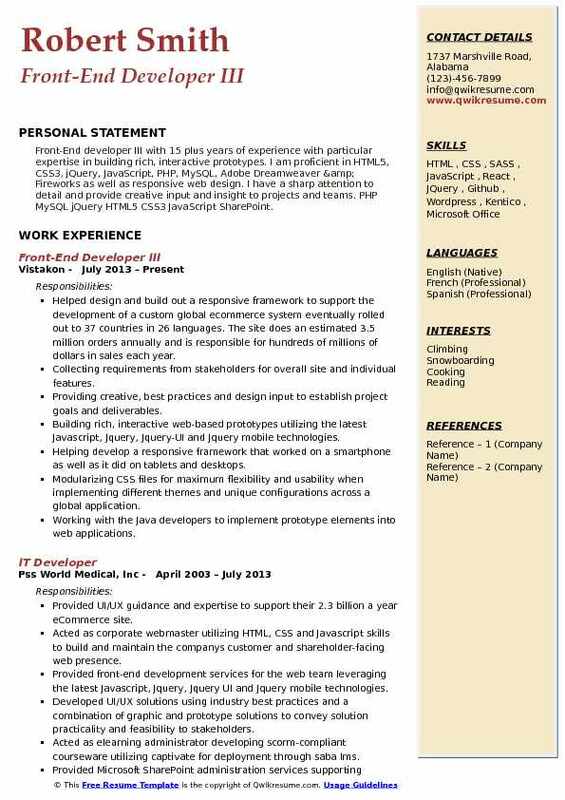 Experience in Enterprise, Telecom, Trading, System Integration Tools, and Products, B2B, B2C, and C2C. Experience in developing web applications using Html5, CSS3, React, Redux, React-redux, Jquery, Angular, Polymer, LESS/SASS, Bootstrap. 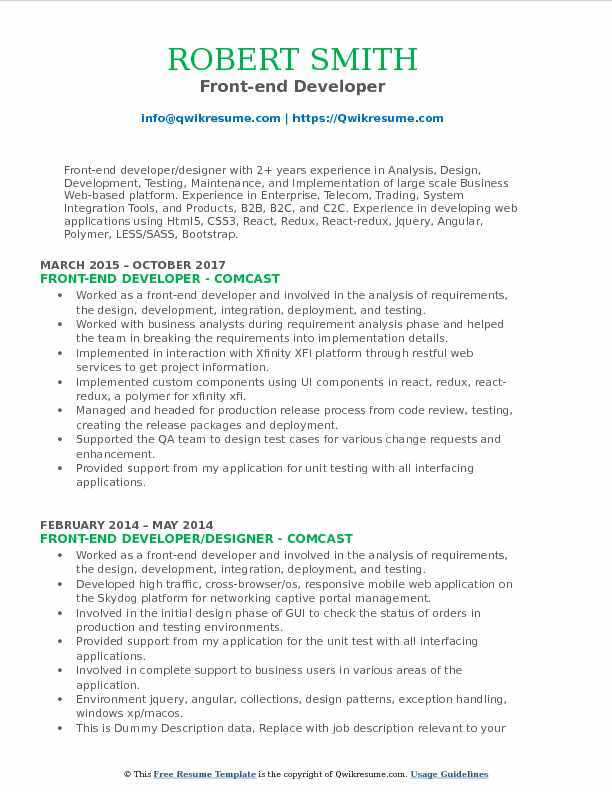 Worked as a front-end developer and involved in the analysis of requirements, the design, development, integration, deployment, and testing. Worked with business analysts during requirement analysis phase and helped the team in breaking the requirements into implementation details. Implemented in interaction with Xfinity XFI platform through restful web services to get project information. Implemented custom components using UI components in react, redux, react-redux, a polymer for xfinity xfi. Managed and headed for production release process from code review, testing, creating the release packages and deployment. Supported the QA team to design test cases for various change requests and enhancement. Provided support from my application for unit testing with all interfacing applications. Involved in resolving various operational issues that affect order flow to/from the interfacing systems. 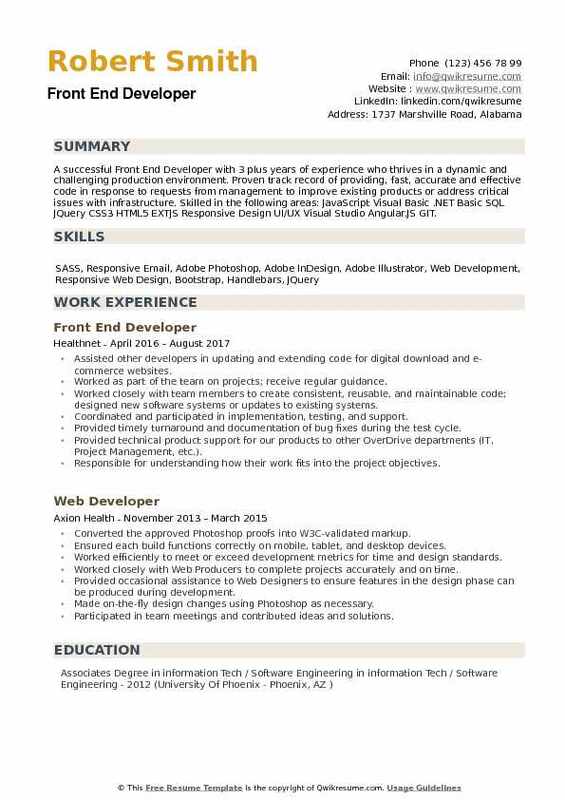 Undertook various responsibilities in a job which requires good coding, problem resolution and communication skills. 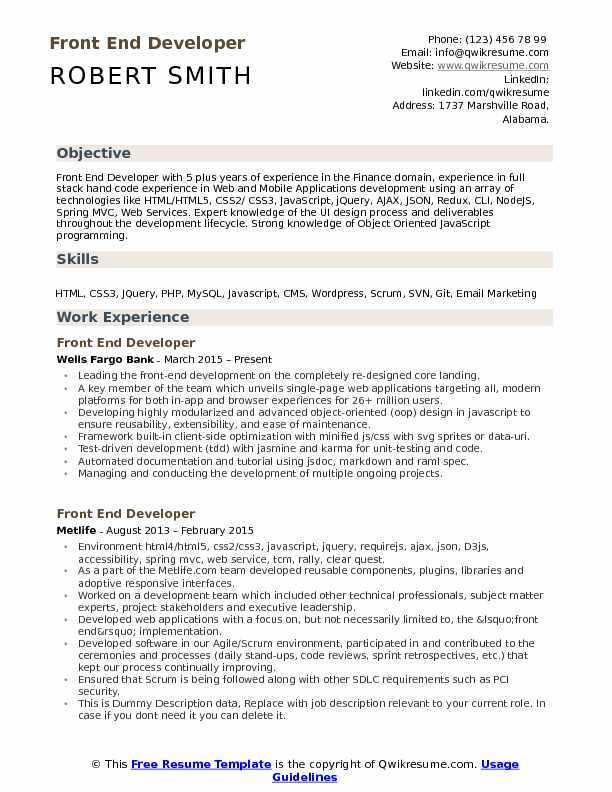 Summary : Front End Developer with over 13 years of professional experience in analysis, design, development, build and deployment of large, scalable, distributed Java/J2EE based enterprise applications with Front End development. Designed responsive payment form & receipt page using Bootstrap, Jquery, Angular JS, HTML5, CSS, and Grunt. Implementing the error handling and validation as part of library framework. Working on third-party libraries to developed HTML documentation for the library. Used AngularJS as a framework to create a single page application (spa) which can bind data to specific views and synchronize data with the server. Used Ajax, JSON to send the request to the server to check the functionality of the websites. Created the Node.Js express server MVC framework from front-end side AngularJS to the back-end, in order to provide broadcast service as well as chatting service. Helped design and build out a responsive framework to support the development of a custom global ecommerce system eventually rolled out to 37 countries in 26 languages. The site does an estimated 3.5 million orders annually and is responsible for hundreds of millions of dollars in sales each year. Collecting requirements from stakeholders for overall site and individual features. Providing creative, best practices and design input to establish project goals and deliverables. Helping develop a responsive framework that worked on a smartphone as well as it did on tablets and desktops. Modularizing CSS files for maximum flexibility and usability when implementing different themes and unique configurations across a global application. Working with the Java developers to implement prototype elements into web applications. 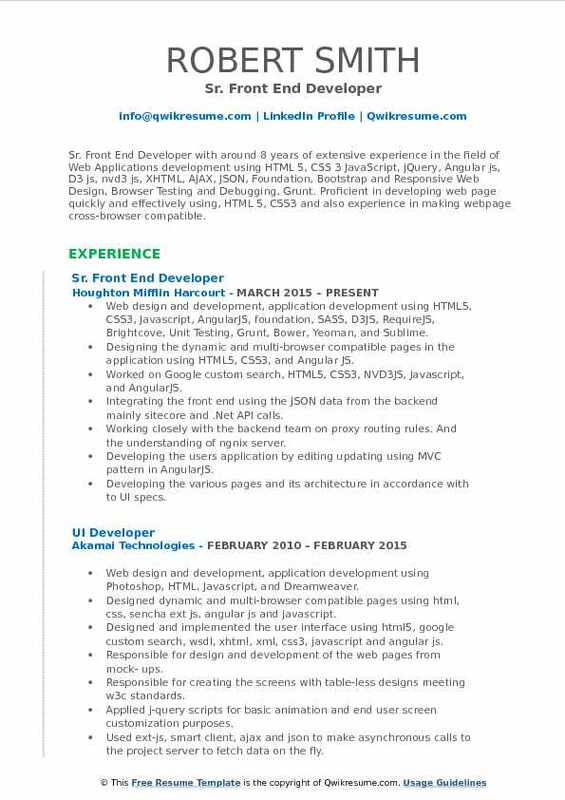 Assisted other developers in updating and extending code for digital download and e-commerce websites. Worked as part of the team on projects; receive regular guidance. Worked closely with team members to create consistent, reusable, and maintainable code; designed new software systems or updates to existing systems. Coordinated and participated in implementation, testing, and support. Provided timely turnaround and documentation of bug fixes during the test cycle. Provided technical product support for our products to other OverDrive departments (IT, Project Management, etc.). Responsible for understanding how their work fits into the project objectives. Responsible for using metrics to understand quality, complexity, security, and scalability of work. Responsible for assessing the scope and the complexity of the project to be able to deliver on required tasks. Worked closely with team members to review code for best practices and standards.